Google has done a great job of explaining complex ideas in ways that are easy for the average user to understand, covering everything from browser cookies, to IP addresses, to cloud computing. They've presented a thoughtful retrospective on the evolution of browsers and how the web in changing the way we work and play online. 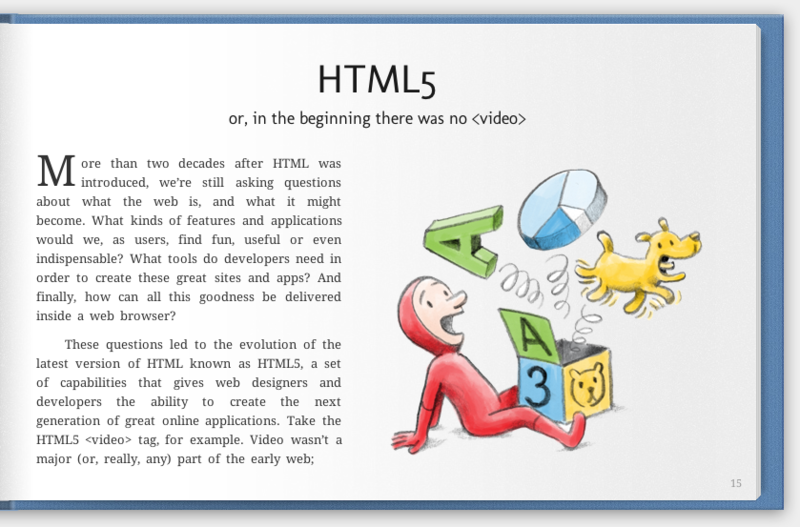 The e-book is also a really cool demonstration of the power of HTML5 standards with really neat interaction tricks. "Take the HTML5 <video> tag, for example. Video wasn’t a major (or, really, any) part of the early web; instead, internet users installed additional software called plug-ins, in order to watch videos inside their web browsers. Soon it became apparent that easy access to video was a much-wanted feature on the web. The introduction of the <video> tag in HTML5 allows videos to be easily embedded and played in web pages without additional software." HTML5 standards are hugely important to the history of online video: finally, video is treated as a core element of any online experience, instead of being tacked on as an afterthought. That being said, standards adoption can be a slow process, and in this case is dependent upon browsers and device creators taking up these standards. Apple has led the charge by supporting making the bold decision to support only HTML5 (as opposed to Flash) on its iOS devices, and Google's Chrome browser is innovating and experimenting in really interesting ways. That's why Brightcove has joined the ranks of these industry leaders by supporting HTML5 video with Smart Players that automatically detect user environments and intelligently send the compatible video rendition to match the environment, so your video is beautiful every time on every device, including HTML5-based iOS devices like the iPad. And more importantly, Brightcove takes care of it all so you don't have to worry about it! Sign Up Today to see your HTML5 Video on an iPad or iPod Touch! When you activate a new Brightcove account before November 30* (TODAY! ), you can receive an Apple iPad, iPod Touch, or Apple Gift Certificate for opening your account. That way, you can see your HTML5 compatible video live for yourself. Activate your account today and receive your device in time for the holidays.